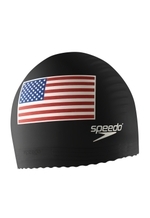 The champion's choice – USA printed flag design on both sides of cap. Durable latex cap provides optimum UV protection with tear-resistant construction. Comfortable anti-roll edge provides secure, watertight fit. Lightweight design for dynamic performance.